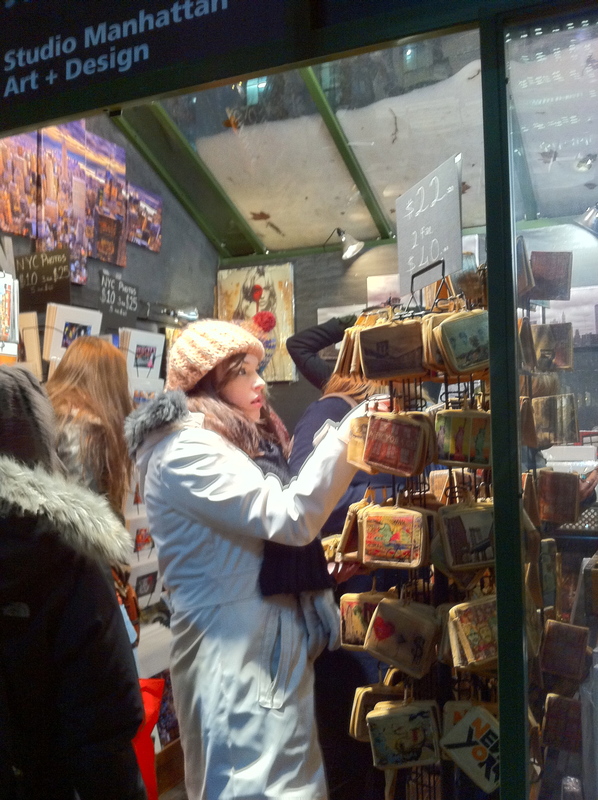 Every year during the holiday season, artisans and merchants sell their wares to New Yorkers and tourists alike in Bryant Park in Manhattan. Rows of pop up shops create a mini village around Citi Pond, where people ice skate and party village where people browse and carouse. 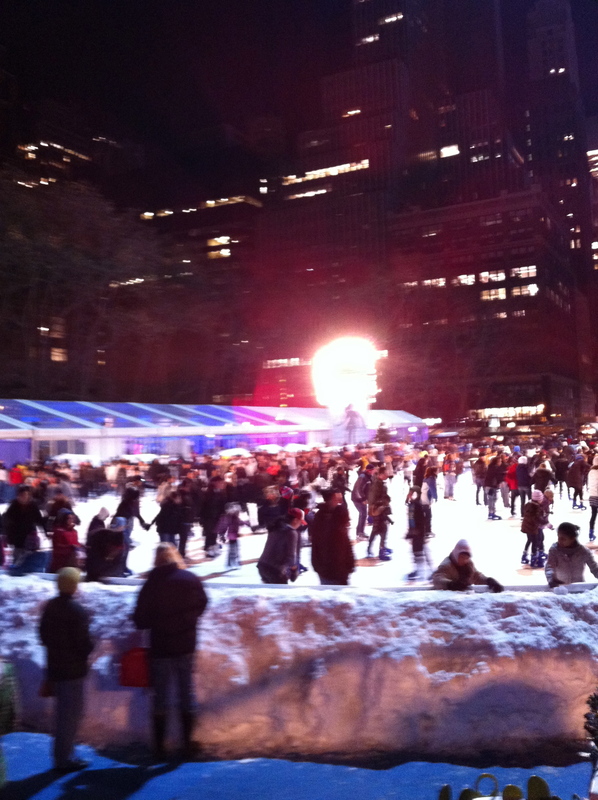 The center of the park is Citi Pond, New York City’s only free ice skating rink. It takes up the center of Bryant Park from early November through the end of February, where long lines wait to glide along the frozen surface and move in circles around the rink. A fun place for families and a romantic spot for couples, several of whom have gotten engaged on the ice this holiday season. 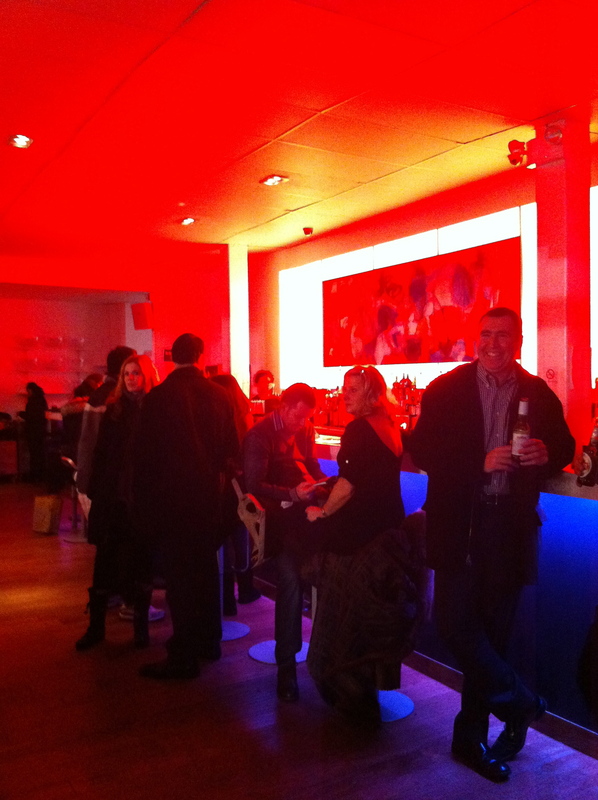 Overlooking the ice rink is Celsius, a pop up restaurant sponsored by Absolut. Established each year in October and removed in February, the two story glass enclosed restaurant looks out over the park, where diners can stay warm while the watching the happy skaters. The first level also has an outdoor patio that is warmed by heat lamps, letting people carouse in comfort on the cold winter nights. Housed in rows of green storefronts, commerce engages around the surrounding park. Jewelers, photographers, and other artists ply their wares to consumers as they make their way through the park. One such merchant is Studio Manhattan. Studio Manhattan takes the photography of Ayhan Kimsesizcan and applying it to such things as gallery prints, canvases, magnets, purses and other items. Ayhan was a photojournalist who came to New York and began taking pictures before applying them to wall art and other items. An array of his work can be seen on the Studio Manhattan website and they will be assorted running deals for the remainder of the holiday pop up shop. Although most of the jewelers at Bryant Park are more oriented for women, I found some amazing watches from Mistura Timepieces. Making their watches from hand selected wood from South American forests, which are taken via sustainable methods then naturally cured and dried before the artisans hand construct the watches. 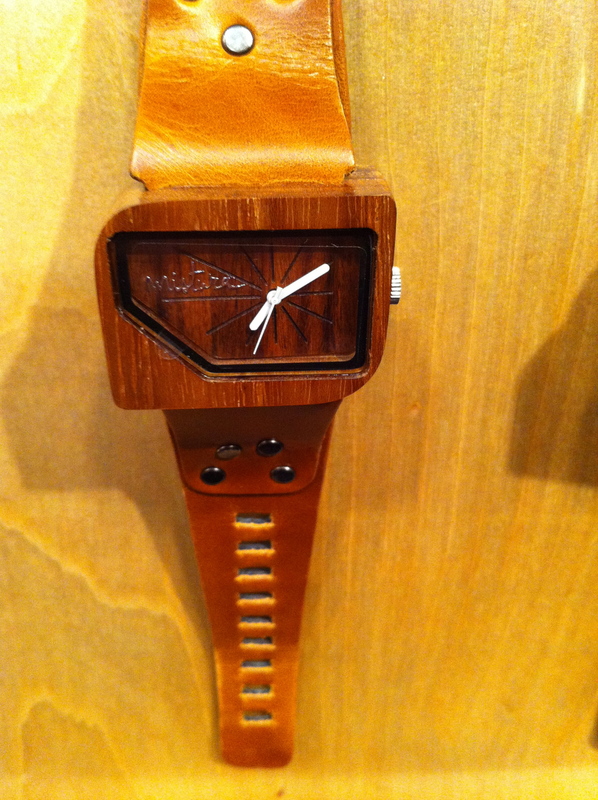 The wood faced watches have a very unique, natural look that are complimented well by their leather bands. 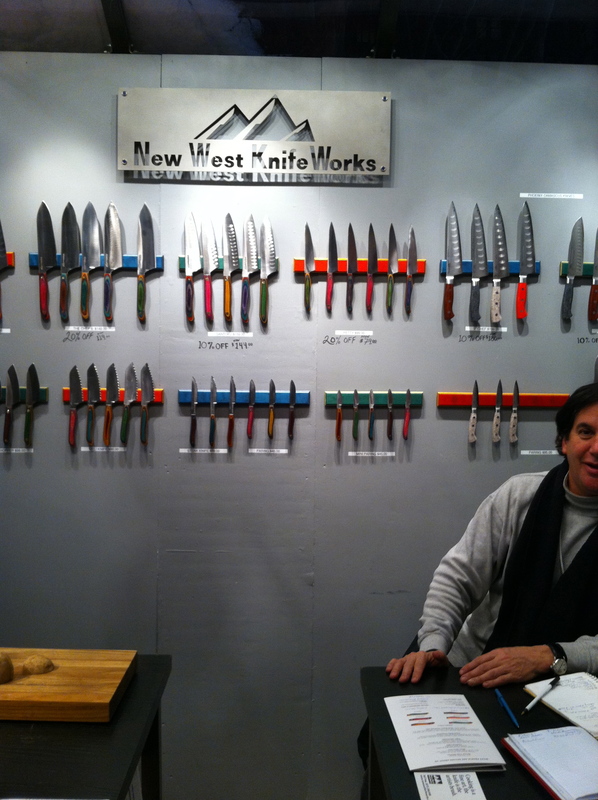 Along the more utilitarian art are the knives from New West Knifeworks. Designed by “The Cowboy Chef” Corey Milligan, these knives are a nice mix of older style mixed with new technology. The handles have a smooth finish over the Colorado inspired colored Fusionwood handles that are easy to hold and use, holding high carbon, chromium steel blades that seem to hold their edge well. I purchased a paring knife after viewing their wares and it slices well through the fruit I tried it out on. The knife also came with a leather sheath to both protect the blade and to protect me from it. Although the New West Knifeworks doesn’t have a permanent New York storefront, their knives can be viewed online for now, for both more consumer oriented knives and those for professional chefs. One of my favorite returning vendors is Metal Park, who take motorcycle parts and other assorted scrap metal and refashion them into pieces d’arte. 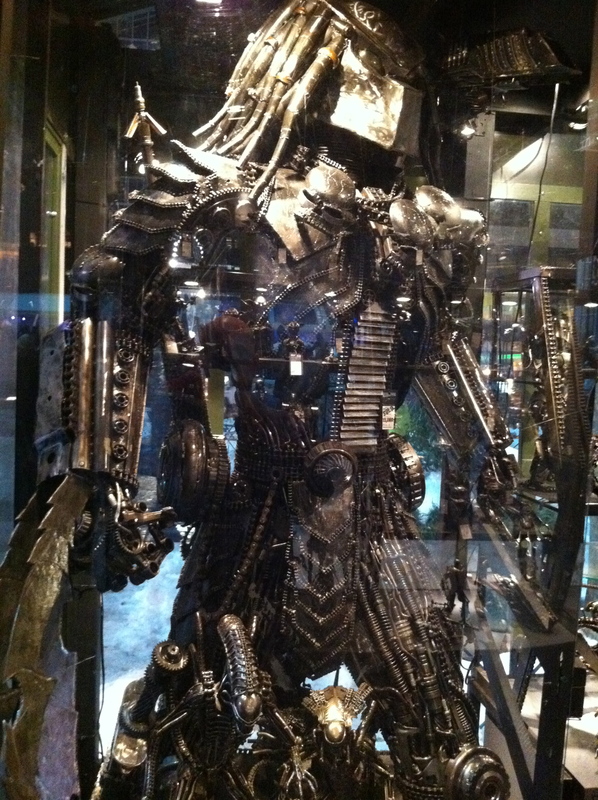 Inspired by such films as Star Wars, Alien, Predator and Transformers, the twelve metal working artisans create male oriented statues and jewelry that appeal to the pop culture oriented who want something a bit more artistic than the plastic representations that are mass produced for the general populace. The Bryant Park shops and Citi Pond are like an oasis in the middle of Midtown Manhattan. Whether it be to visit the artists’ shops or to share a drink on the warm terrace of Celsius while looking out at the snow, this small hamlet within the confines for four square blocks exists for only a couple months before disappearing like the melting snow, only to return again next year.